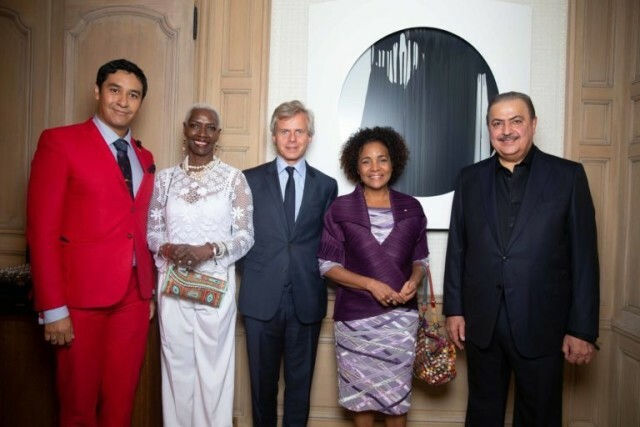 Henri Estramant, Esther Kamatari, Laurent Boillot, Michaelle Jean, Rashid Al Khalifa, exposition “Les Roses de Bagatelle” Rashid al Khalifa. Guerlain. 05/2018 © david atlan. Artist Rashid Al Khalifa's recent series Les Roses de Bagatelle opened at Guerlain, 68 Champs-Élysées, FR-75008 PARIS on 5 May 2018. The exhibition remains open till 8 June 2018. A continuation from the iconic convex form takes precedence as the foundation of Rashid's work, each piece in these series employ delicate and intricately crafted aluminum flowers onto the curved, matte-enameled surface, in patterns. The resulting symmetrical compositions further demonstrate Rashid's desire to formulate statements on minimalism, purity and balance, this time including natural representations of roses upon the foreground. The artistic cooperation's VIP vernissage was held under the auspices of Guerlain's President Laurent Boillot, Guerlain's Brand Ambassador Princess Esther Kamatari under the organisation of Guerlain's artistic team Élisabeth Sirot, Heritage Director, Ann-Caroline Prazan, Artistic Director and Royal Bridges' Managing Director Henri Estramant. Chief guest during the vernissage was Her Excellency The Right Honourable Michaëlle Jean, Secretary General of La Francophonie as well as His Royal Highness Prince Nikola II Petrović-Njegoš of Montenegro (second in his homeland's state protocol). Other prominent guests included HRH The Duke of Noto, Prince Jaime of Two Sicilies (heir to the Two Sicilian Royal House), HI&RH Archduke József of Austria, Prince of Hungary (heir of the Palatines of Hungary branch of the Habsburg Dynasty), Princess Sonia Poniatowski, Princess Tatiana Radziwiłł and spouse Dr John Henry Fruchaud, Prince Ignace Pascal Kamatari, Prince Yves Nsaku Moembo, Princess Chantal d'Orléans of France and spouse Baron François Xavier de Sambucy de Sorgue, Count Thierry van Limburg Stirum, or even Sri Lanka's Ambassador to France, Buddhi Athauda (formerly Ambassador to The Netherlands). Luxury houses such as Bvlgari, Chaumet, Sotheby's, Cartier and more as well as representatives of the French Foreign Office in charge of the Middle East and Bahrain attended the function.